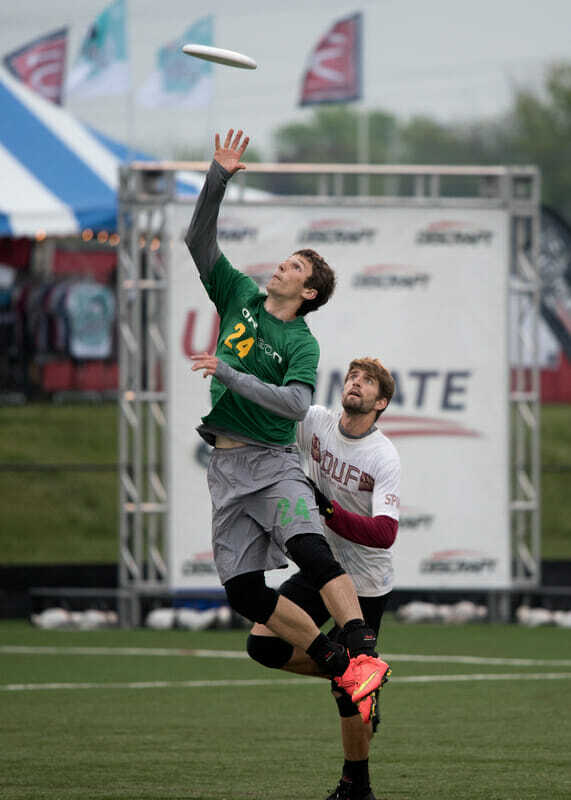 Here are Ultiworld's 2015 College Awards. 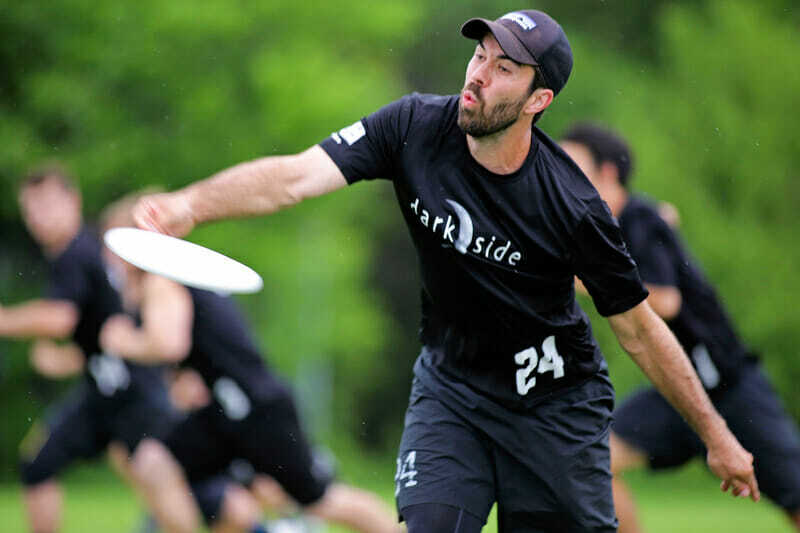 Disclosure: This post is brought to you by National Ultimate Training Camp. All opinions are those of Ultiworld. Thanks for supporting the brands that make Ultiworld possible! 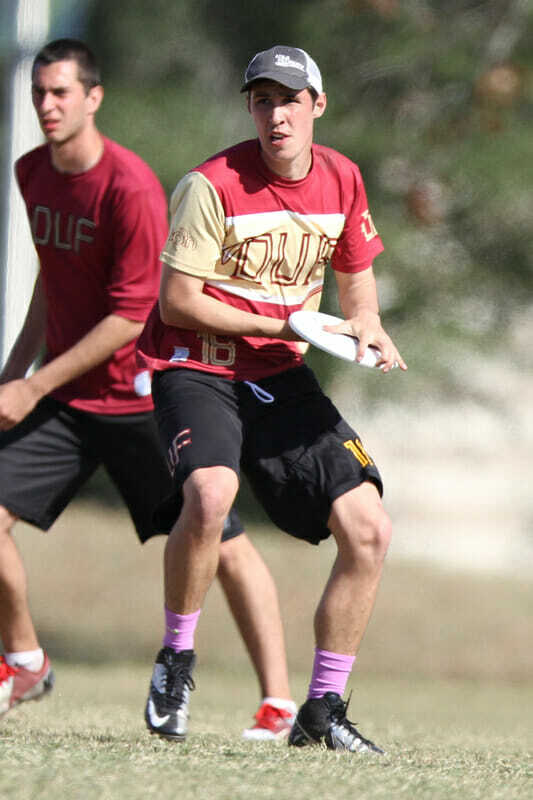 Ultiworld is pleased to announced the second annual Ultiworld Player of the Year and other individual college awards. The award criteria can be found here — we considered both regular season and postseason performance in our selection of awards. Though the input of Ultiworld reporters is weighed heavily, final decisions for awards were made by the editors. All winners will be sent a custom-designed VC Ultimate jersey as a prize for their outstanding seasons. Chris LaRocque may not the best thrower in college. He may not be the most fearsome defender. He may not be the most effective deep threat. But he is the most complete player in the College Division. 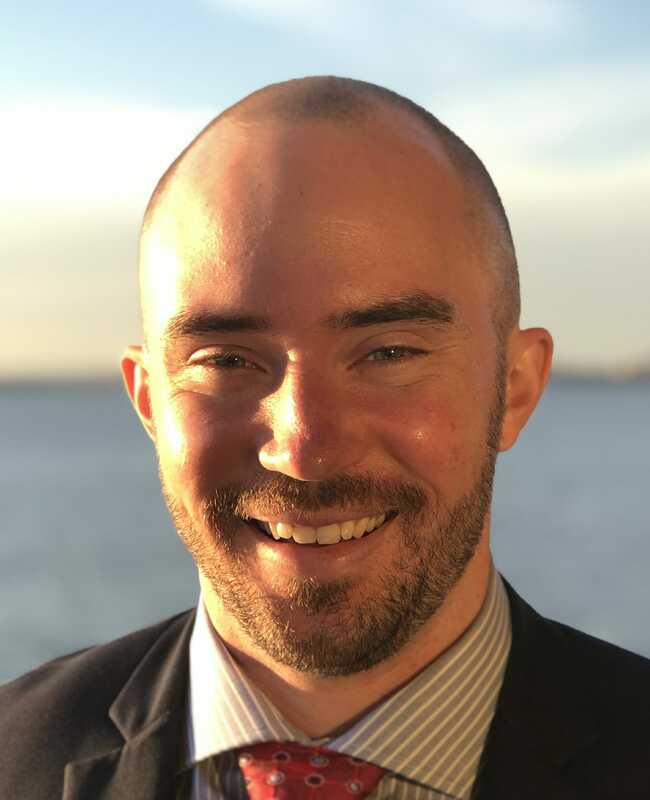 LaRocque sustained a level of excellence this season that few players could match and provided nearly everything the team needed on its march to the semifinals. For a team that wasn’t even a Sunday Regionals threat five years ago, FSU has grown together with LaRocque. After a superlative regular season, he came into Nationals and showed why he absolutely, no-question-about-it should have been a Callahan award finalist. He finished the weekend with 40 assists (second only to Jon Nethercutt) and 12 goals. His combined 52 points were the most at the tournament, even surpassing Nethercutt (who played an additional game). LaRocque didn’t just pile up counting stats. He’s one of the most lethal break throwers in college and has long been a skilled hucker. He can create separation going deep and sky the opposition’s best deep defender. More importantly, his defense was just as potent. He went toe-to-toe with UMass’ Jeff Babbitt in the quarterfinals and won the matchup. 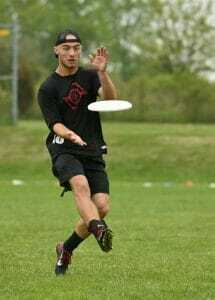 What’s more, he helped create the team’s ‘hit the ground’ mentality on defense with his jaw-dropping layout blocks. It’s not hard to see his impact. A similarly talented FSU team a year ago was without Chris LaRocque at Nationals; he had to miss the tournament for a wedding. They finished tied for 13th. This year, they finished tied for 3rd. Chris LaRocque was the most outstanding player in the country this year, and we are pleased to crown him Player of the Year. It should be little surprise to see Jon Nethercutt atop this category. The flamethrowing handler for this year’s National Champion, Nethercutt has been perhaps college’s best thrower for two years running. He was easily the assist leader at Nationals and finished with just a hair under 50% of UNC’s total assists. This season, even more than last year, Nethercutt dominated possession for UNC’s offense. He was the quarterback of the team, touching the disc often on every other throw and firing a wide array of throws, from full-field flick hucks to lefty scoobers. His skill set was so potent that he transformed the defensive line from a grind-it-out crop of under cutters into an offense almost as high flying as the O-line. There’s a reason that UNC crushed every team in their path this weekend, and it started with Nethercutt’s throws. Though Nethercutt’s regular season performance was not what it was in 2014, he was a man amongst boys throughout most of Memorial Day weekend. 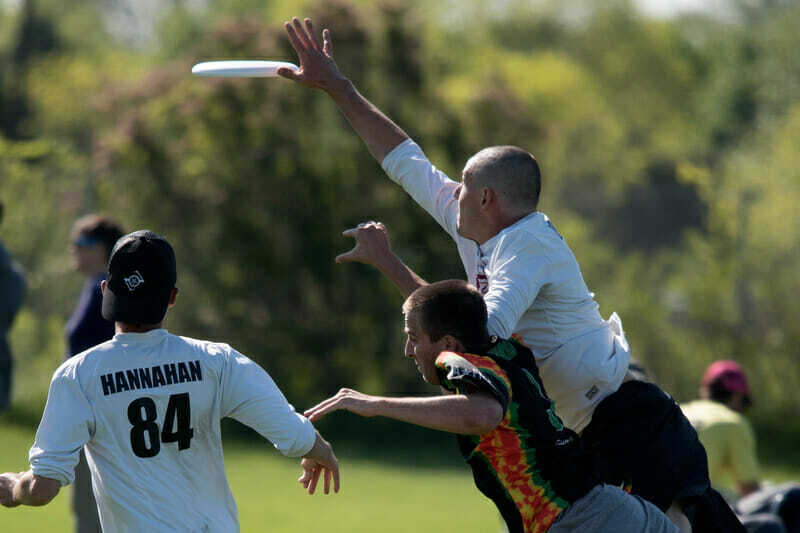 Jeff Babbitt, the 6’1″ athlete from Massachusetts, is this year’s Defensive Player of the Year. Even in UMass’ sluggish points during the regular season, Babbitt was a one-man highlight reel on defense, coming up with unbelievable blocks with his combination of length and closing speed. Babbitt anchored the team’s vicious 1-3-3 zone defense from the wing position, often ranging around the backfield like a free safety. Teams started to learn quickly not to throw anywhere near him — even if he looked out of position, he would fly back into the play and wreak havoc. UMass got blown out by Pitt earlier this year at Easterns, but, again, there was Babbitt, delivering outrageous blocks on throws that looked wide open. Of course, Babbitt was also a nightmare for deep cutters, and he dominated UNC Wilmington’s Jack Williams — one of the Division’s best deep cutters — in their pool play game to lead the team to the upset win. Babbitt is still offensively unrefined at times, but his defensive prowess is undeniable. Sophomore handler Adam Rees may have operated in the shadow of 5th year senior Dylan Freechild this season, but don’t expect him to be underdiscussed for long. Rees had a super year as one of the most consistent players for Ego, who reached their fourth straight semifinal and advanced past FSU to the final this year. Rees has more than high-skill throwing ability. He’s an excellent defender and pulled weight at times for Oregon when they needed him. He has superb field vision and a lofty ultimate IQ. He’s already in a position to gobble up a lot of the assists that Freechild will leave behind after this season. The 2014 Freshman of the Year in the Northwest Region, Rees is poised to fill into Oregon’s superstar role now that Freechild is graduating. While Connor Matthews has had a lot of buzz for his high-flying acrobatics in the end zone, Rees has been the workhorse — and the more consistent player. We expect big things from the rising junior — he’ll keep Oregon more than relevant in 2016. In a year with more freshmen talent than we’ve ever seen before, UMass’ Brett Gramann rose above the pack. Gramann was a top three player this year for the T-5th place team at Nationals and often led the offense with his reset ability, superb throwing touch, and competitive spirit. Gramann played well above the level of a typical rookie, and was much more of a leader than you would ever expect from a freshman in college. He is clearly a future captain of this team. After a breakout performance at Queen City Tune Up, Gramann was sidelined with an injury during Centex. Despite being hurt, he never missed a practice and was a vocal leader on the sideline and between points. Now, back to Nationals. He led the team in assists (16) and finished fifth in goals (4). He was a rock-solid handler all weekend long and made some incredibly gutsy and impressive throws to help lead the team to its highest Nationals finish in decades. Gramann, who’s been playing since middle school and came up under coaches like Cara Crouch and Mike Natenberg in Texas, was the wire-to-wire leader in the ROTY discussion and will be a mainstay of the college scene for years to come. It’s easy to gloss over the 2015 regular season when you consider UNC’s Championship run this season. They made it to the final in 2014, then finished the job in 2015. No surprise. But after losing Christian Johnson, Charlie Schaffner, and a host of other experienced seniors, UNC was nowhere near a title contender at the beginning of this season. There were growing pains. They got blown out by UMass in February. They didn’t win tournaments or dominate anywhere near like they did a season ago. It’s incredibly impressive, then, that this team was as strong as they were in the postseason. Much of the credit has to go to UNC coach Mike DeNardis. DeNardis is now a household name in coaching circles. 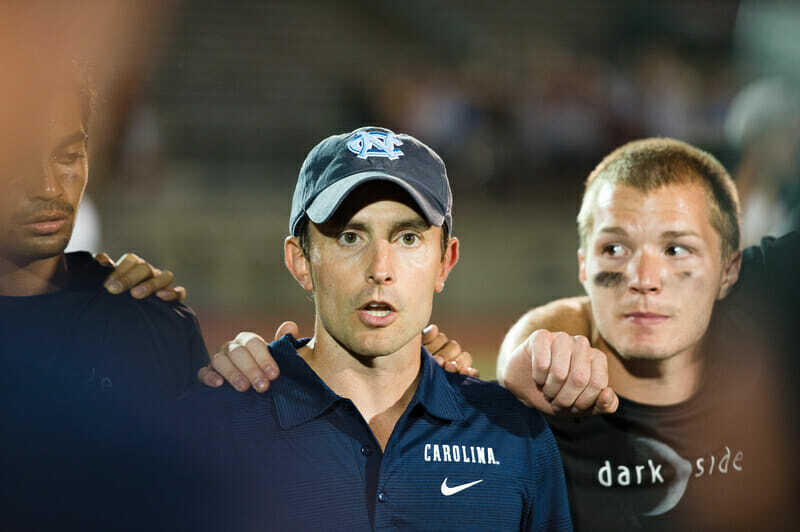 Not only has he been leading Darkside for years now, but he took over as the coach of Raleigh Ring of Fire last season and also leads (and partially owns) the AUDL’s Raleigh Flyers. He’s a bit busy. Yet he managed to keep a frustrated group of seniors focused on the prize at the end of May as they slogged through some tough points during the regular season. There were lots of rookies and sophomores out there on defense. They ran basic sets and didn’t surprise teams with unusual offensive or defensive looks. And they waited. DeNardis kept a few cards up his sleeve, then unleashed them at Nationals to great effect. He had learned a lot from last year, when the team had been heavily scouted. But more than being one of the best Xs and Os coaches in the game, watching tons of game film, and preparing as well as any coach in the Division, he managed the emotional challenge of going from winning almost every game in 2014 to struggling at times in 2015. He even had to manage his own mental wellbeing, like when he skipped Centex to prepare for opening day in the AUDL. DeNardis has long been a top coach, but he rose a level this year with his hidden ball trick, his focus on rookie development, and a singular focus on what really mattered: winning in Milwaukee. Comments on "The Ultiworld Men’s Player Of The Year And College Awards, Presented By The National Ultimate Training Camp"